Biden should not pledge to serve one term. It would advertise his age by suggesting that he’s not fit to serve two terms. And if he’s not fit to serve two, people will wonder if he’s fit to serve one. Former Vice President Joe Biden, who is expected to soon launch a bid for the presidency, is reportedly considering selecting a running mate early in his campaign. 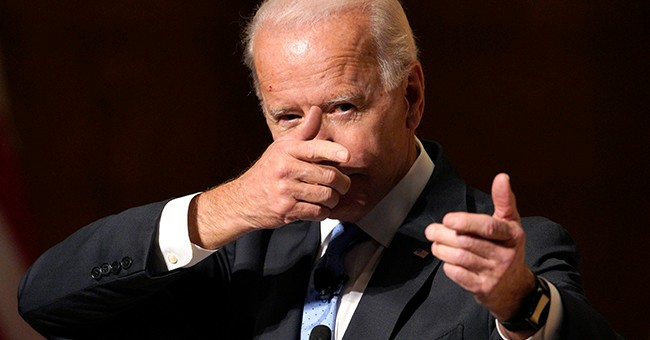 Citing Democrats familiar with Biden's plans, CNN reported the possibility on Monday. An aide told the network that naming a running mate early would help Biden keep the focus on the Democratic goal of defeating President Trump in the general election...Biden has discussed the possibility in conversations with advisers as well as with top Democrats and elected officials, according to CNN. A new CNN poll shows Biden far ahead of his closest rival, more than doubling Bernie Sanders' support, 30 to 14 percent. Incidentally, the same survey shows more than 70 percent of voters calling the economy "good," which is certainly welcome news for the Republican president. But let's say, for the sake of argument, that Biden bursts out of the gate with momentum, then reveals his running mate pick long before winning the nomination. Who might be select? Tapping any of his fellow contenders could be seen as demeaning or insulting, so that would be a risk unless he huddled with that person in advance and they enthusiastically signed onto the idea. He'd also need to play the identity politics game, mitigating his vulnerability as an older, white, heterosexual male. And Biden would also likely be heavily inclined to team up with someone with sterling progressive credentials, given how he'd be viewed with suspicion by the party's growing left wing.